Welcome to Past Peculiar, hosted by Alpha History. Human history is jam-packed with offbeat characters, quirky stories, strange theories and bizarre ideas. At Past Peculiar we draw on primary sources to expose these historical oddities. Not only are these stories fun, they show how far human society, knowledge and understanding have progressed. 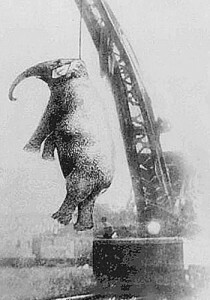 For example, did you know that the people of a Tennessee town once lynched an elephant accused of murder? Or that 19th century doctors advised women not to study while pregnant, in case the child was born with an enormous head? Or that women were told not to read novels because it was detrimental to their “health and morals”? Or that standing on one foot was thought to cause masturbation, insanity and death? Or that playing the piano was once considered was “deadly” for young girls? Or that a man named Stephen King once frightened himself to death? Or that giving women voting rights was expected to turn them into “barbarians”? Or that Americans judges, as late as the 20th century, considered beating your wife a legal activity, so long as you didn’t kill her? Past Peculiar contains hundreds of these stories, all drawn from primary sources. To browse our posts, click on the ‘Categories’ link in our top menu or sidebar, select a topic and begin reading. Please note: Past Peculiar contains stories you won’t find in History class. Some posts may not be appropriate for readers under 16 years of age, so reader discretion is advised.